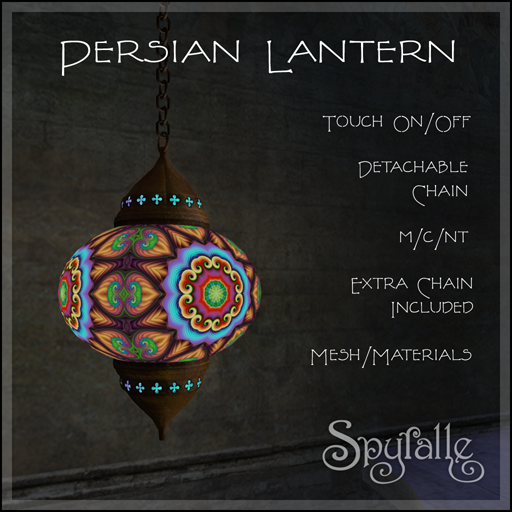 Created especially for Silk Road Hunt 6 and inspired by classic Persian lamps, this original mesh lantern is the first of a new series of artistic lighting from Spyralle. Suitable for your modern, ancient or fantasy home or garden, the lamp comes with a detachable chain, extra chain and on/off script. The glass globe and antique metal fittings are materials ready. Land impact depends on size; out of the box LI = 1, with chain. The fractal used on the glass is a folk art inspired kaleidoscope from the designer’s catalogue of original fractal images. This entry was posted in Hunts, New Release and tagged fractal, Hunt, Lantern, mesh, Silk Road, Spyralle. Bookmark the permalink.